Hdfc bank – the pioneer in credit card industry has come up with a unique offering few years back for ultra rich Indians – the Infinia credit card. As the name signifies, it denotes limitless possibilities in every aspect. This is one of the best super premium credit card in India that every credit card enthusiast would dream of. It offers maximum benefit, starting from lounge access to golf courses and even the credit limit. 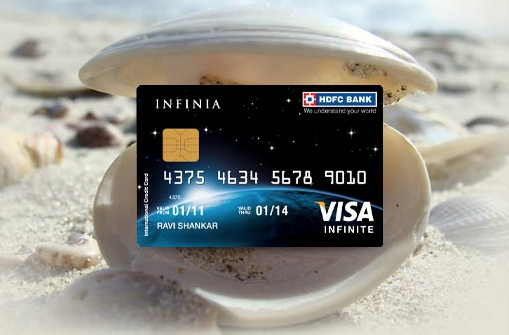 Infinia Credit Card falls under “Visa INFINITE” or “Master Card World” and comes with a minimum credit limit of 8-10Lakhs. It might as well come at lower limit when the limit is split or when the ITR is not as expected. Yet, there is no issue when it comes to Credit Limit on this card as it has unique NPSL* (No Pre-set Spending Limit) feature, which means they may “temporarily” increase the limit if you inform the “Infinia Support Team” prior. This feature is unique to Infinia and is not applicable to any other HDFC card. Love EMI’s? You can put anything and everything on EMI for years together with this kind of Credit limit when you run short of money. You may avail higher amount of insta loan & insta jumbo Loan on credit card too if you need quick cash! You get 5 reward points for every 150.rs spent anywhere and everywhere – Wallets & fuel excluded. This gives you an equivalent amount of Rs.3.30 for every rs.100 spent, meaning you can easily save Rs.3,300 for every 1 Lakh you spend on the card. Not just that, you can save 2X if you spend on dining & airvistara/hdfcbankinfinia website. That’s equivalent to Rs.6,600 in savings for every 1 Lakh spends. With Priority Pass membership, you can get unlimited access to airport lounges across the globe (both domestic & international). One of the biggest advantage of this card is that even the supplementary card member gets unlimited lounge access. Note that your Priority Pass wont be charged even on domestic swipes, unlike other HDFC cards. Apart from priority Pass, you may also use your “credit card” itself to get access through Visa/MC Lounge Programme. Lots of savings and peace of mind during travel by resting in a comfortable place. With Lounges, you have access to complimentary food, wifi, coffee, posh interiors, etc. This is quite beneficial if you travel with your partner/children. Thinking of a World tour with family and free lounge access everywhere? Infinia Credit card is for you!! It has the lowest 2% foreign currency markup fee, making it the best card to swipe abroad. I should say, HDFC Bank Infinia credit card is the best credit card for international travel you can ever have. Connect faster with dedicated Infinia customer support who can really understand your queries, unlike regular HDFC support. Note that the Diners Black & Infinia share the same support and they’re usually knowledgeable. Medical emergency cover: Up to Rs 50 lakh against medical emergencies during travel abroad. So you don’t need to take a separate Travel insurance when you travel abroad – Infinia covers you all. Apart from that, you can also withdraw cash of upto 40% of your credit limit without any cash withdrawal charges, however, interests will be applicable. That’s a million $ question, though, after knowing good # of the Infinia cardholders for a while, i can say: its not a child’s game. Most HDFC Premium credit cards are issued/upgraded based on the credit limit, but Infinia needs more that just limit. For Fresh Card: You need 45L ITR to get a fresh card. You might still need to open HDFC Savings A/c to process your request. Maximum exposure to other HDFC products: Current a/c, Demat, Insurance Policies, Loans, Family accounts, etc. In other words, you need to be a real High Net-worth Individual, or, should have given decent profit to the bank in the past to get approved for Infinia. They give back what they have earned from your past relationship with the bank – those profits they made on interests, loans, insurance policies, etc. Unless or until you’re so much bothered about air miles, there is no better credit card you can ever have in India except Infinia, especially for Priority Pass. However, as you see, getting approved for one is not that easy. If you’re finding it tough to grab one, consider going for Diners Black Credit Card as its even better with 10X rewards, yet acceptance is not guaranteed. Next best is Regalia credit card which stands one step below Infinia. Impressed about the features? Do share your views in comments below. Still confused as where to start? Drop your comments below, or Catch me on call, i can come up with a bespoke solution based on your financial situation to help you get one. Check out my Consultation page. You need to take the annual fees of the card when you gush about the 3.3% discount. Does not seem seem too great against a 30kfee to get in. will there be additional annual fee for add on cards for other family members. No, Add-on cards are generally free. But some guys i knew have received it as they have better relationship value with bank. Completely depends on the customer profile and HDFC doesn’t have any pre-set rule for the same. how can I apply for this credit card? I don’t see any option. Its invite only card. You should ask your RM or visit branch. I can see that its not mentioned anywhere now. But i happen to see it earlier (an year back). maybe they’ve changed the policies now. Better to have a word with HDFC support for more info. Have you heard cases where this card is offered as a lifetime free card? I currently have a regalia card on which I have spent about 6 lacs in the last 8 months that I’ve had the card. Wanted to know if I can get a lifetime free upgrade. Drop them an email and give it a try. If your income on IT and relationship value is good enough, they may issue infinia as LTF. You can get easily with that IT if you’ve used the other card with HDFC for an yr or so. They either need your usage history or sky high IT. Citi Prestige has unlimited access as well. I GOT ADD ON INFENIA CARD FOR MY WIFE. WE DO TRAVEL. A PRIORITY PASS CARD WILL BE REALLY HELPFUL. SHE DID NOT GET Priority Pass card WITH THE WELCOME KIT. SHOULD I APPLY FOR IT. Yes, for Add-on Cards, you have to request priority pass Card separately over Infinia Helpline. Maybe they’re issuing as your 4 yr track record is good, also depends on how much balance you’re maintaining on your Savings A/c. I tried hard to get Infinia card, however it has been rejected. I am an Imperia customer and holding Regalia from a very long time. My banking history is very good with very high balance maintained. Inspite of this, my request was rejected stating that take home salary should be 3.5 lakhs. Thanks for the awesome blog post. I am a super high spender. (2-3L spend a month). Which card should I opt for (Infinia or Regalia). Obviously infinia, if you’re eligible for it. Hey Siddharth….a very informative forum indeed! could you do an article on best credit cards for all categories please? I already own an Amex Platinum Card. Want to go for another Card with a premium feel but a Master/Visa that is accepted everywhere. Which one shuld I go fr.. Spends on my new card will be ~2 LPA.. as I plan to limit my spends on AmEx to 4L.. for Maximum benefit seeking. Also, I splurge a lot o f money but dont like paying much for an Annual/Renewal Fee. Was considering Regelia.. Heard they are downgrading it.. Still worth it? Or something else? Regalia is still good. You can also checkout Yesbank/SBI cards. And of course Infinia if you’re eligible. AMEX Platinum is a top of the line charge card in India. It comes for a cool ₹50K/annum fees. I guess, you wanted to say AMEX Platinum Travel Card. Nice forum, I am a regalia holder i think since atleast 4 – 5 years. They have steadily increased limit to 6 lakhs which i presume is max for regalia. I want to upgrade to infinia but they say it is by invitation only. I am a heavy spender with good credit history with ITR of 13L. I feel there is not much clarity about eligibility especially after reading Sumit and VK’s case. It will be great if you can get exact information about eligibility criteria for infinia. Thanks. Talk to your branch. Only they can take approval if they’re okay with your usage/limit etc. Since there is unlimited lounge access via priority pass do one gets the PP prestige/PP select or the normal one? Its a normal one with unlimited access. Its like, HDFC buys a bulk amount of visits from PP and give away across multiple cards. PP don’t even know the limits/visits avail on your HDFC issued PP card. According to the membership number you’ve provided, your Priority Pass card was issued to you by your bank or credit card. They issue their own Priority Pass cards and administer their own accounts so you will need to contact them directly for account information, charge information or material requests. It all depends on how long you’ve been dealing with the bank. i just wanted to conform that Hdfc infinia card has a min limit of 10 L and there is no upper preset limit. my query to you is, in the infinia card ‘statment’, what is the Crdit Limit printed\shown? I tried speaking with my RM today, and they mentioned that they need an ITR -> Taxable income of 36 lakhs to be eligible for Infinia, which I thought was absurd! Ive been holding a Regalia for 1.5 years, and an HDFC Classic banking customer for last 5 years. Not sure how do i negotiate with HDFC to get an Infinia card? Please help! It depends on your Credit limit. What range are you in? My credit limit now in HDFC Regalia is 5L, also hold a Yes bank preferred with limit of 3.5L. I got it as a Director of a company. My income was below 10L and Company’s income was above 1 Cr. We are HDFC Bank customer for more than 13 years. Yes, it should be possible because HDFC looks at the overall relationship with the bank. My Regalia shows Upgrade available to Infinia. 1. Points will be reduced by 50% but as I can see points value on Regalia was 0.50 on their portal and for Infinia it’s 1:1 so I hope rewards devalue should not be a concern? what say? 2. RM said lifetime free also possible basis approval but after initial followup with product team he said only 1st year free possible. I read somewhere on renewal they give 10,000 points! so does this still hold good? 10k+gst will somehow be compensated by 10k points, if true? Did anyone get this LTF at all? 8L spends will get fee waiver. You said Infinia gives value of 3.3% but as per HDFC Reward Catalog. for that one has to spend 27900 , then the value is coming as close to 1.79% instead of 3.3%. like in infinia portal in this case. Catalog Redemption’s are poor yes. I have hdfc regalia with limit of 530000 .using it from last 3 yrs. Is there is any to get infinia. Limit is good enough for the upgrade. They look into the usage too. Did u approach the branch? A personal question out of curiosity. What is the credit limit on your Diners Black Card? Amex Gold Benefit are Amazon GV 11000 for 24000 Points. for every 4 swipe of 1000 Rs you get 1000 point , so in a year you get 12000 easily. So its ~ 2% per 100 Rupee spent as compared to Infinia where its lesser value in Catalog redemption. Well, with Gold charge card, you can get statement credit which is the best option than vouchers. yes, i’ve explained this 2% value back on the respective Amex post. Only challenge is the acceptance though. Yeah , I am using from 2011 in Bangalore and Amex getting better and better. I strongly advise AMEX Gold for anyone who ask for credit card. I will be getting my Infinia card in few days so i was searching exact benefits of that my interest is more in Upgrade of my flights already Air india SBI card treated badly in this i transfered all my miles to Air india despite crossing Maharajah status miles barrier i was told i wont get any status well that was my mistake i should have asked before transfer of all my reward points anyways can anyone help me with exact Airmiles i will earn on annual spent of 20 lacs exact as in i mostly travel by Lufthansa , Emirates , Etihad and Turkish sometimes will this Infinia card gonna help me in that ? i have had Amex Platinum since decade along with hsbc platinum and SBI Air india none of them has ever gave me any kind of flying benefits but atleast Amex have been very very kind and they do pay attention towards every small thing customer ask back to help 🙂 i hope someone will guide me how to use this card for my travel . Use the card on 5x and 2x categories that HDFC is promoting these days. That will get you a lot of points which you can redeem for flights as revenue tickets. Btw, good to see yet another Infinia member here. I recently shifted my business to HDFC and I am being offered either the Infinia or the Diners Club Black. Which one would you recommend? Great job with the blog though. Hope to see more posts. Depends on your spend areas. I would recommend black if you travel/shop often to avail their 10X rewards. being the only difference between them that one is a credit card and other is a charge card. Post reading this comment, i asked my Dad (Classic account with Business dealings with HDFC) to apply for this upgrade. And HDFC BM told he will have his Ragalia upgraded to Infinia for Free of cost(anyway existing is free he informed). Without these posts i wouldnt have known all these details. I said lot of thanks, but once again thanks. I am not sure how did you calculate 3.3% reward rate. Per their reward catalog, every point is normally worth of 0.5Rs (500 shoppers stop voucher for 960 points). So for 150Rs, you are getting 2.5 Rupee cash back. That means effectively 1.66% reward rate ? You really need to be loaded to get Infinia. You need a monthly post tax take home of Rs. 3.5 L. By contrast you can get DC Black at just Rs. 1.75 L take home. I have a Regalia card with Rs 600,000 /- limit. Have been using this for the past 2.5 yrs. I spoke to my RM regarding the upgrade. He says only people with ITR of 45 lakhs or more are eligible. I am getting all kinds of offers on netbanking like Jumbo Loan of 10 Lakhs, Insta Loan of 450000 etc except for the elusive upgrade to Infinia. My Regalia is due for renewal this September. Should I wait until September and see if they offer me this upgrade ? any suggestions ? That’s a nice limit Hari. Thank u. I will give it a try. I am not holding bank account with hdfc,but using hdfc credit card from the last 7 years and now holding regalia (holding from last 1 year)with 6Lakhs as limit.whenever ask for upgrade,they mention it is bank invite and I ask in bank they mention need to 30L + as salary.is it correct ? With 6L limit, you’ve more possibility for infinia, if you have their other products like savings a/c. Annual fee has been reduced to 10K these days. Its confirtmed HDFC is not considering existing card limit for upgrade to Infinia. The HDFC BM said the requirement of 3.5 lacs/pm income, is mandatory. He said that this criteria is in place so that the exclusivility of the card is maintained. Criteria is indeed very strict, though, they’ll consider your limits, spends and relationship value. How does hdfc infinia compare with Citibank prestige? With regard to overall rewards, global acceptance and best return for money. It depends on what kind of redemption you prefer. Citi Prestige is mainly for ppl playing the Points and miles game. Proprietor Business? if so, you’ve a chance. Else, its a completely new entity as it comes with a different PAN. No Siddharth its a private LTD company. Then you might get a chance if the said current a/c is with HDFC, which means more relationship value. No I’m an sbi customer. I have Axis Bank Visa Signature Credit Card since 2013 with good credit history, limit 1.9L. Recently acquired Regalia Business, limit 3L and an SBI Elite, limit 1L. Spends are usually 50K per month avg. Should I try hard to get Infinia or do you think I can make good with the above ? Nice expert reviews. I have a question about HDFC Infinia card for you. Is it issued to both Resident Indian and Non resident Indian. I was informed by HDFC that only Regalia is for NRIs. Am not sure about this. Though, i don’t see any reason to differentiate as long as you’ve good Relationship with Bank. I see from the HDFC website that Regalia Visa Signature variant is being issued to Non-Residents as NR Regalia (so Regalia comes as Regular Regalia, Business Regalia and NR Regalia) which seems to require a NRO account with HDFC. The card bill also needs to be settled by the linked NRO account. Being offered both Infinia and Citi Prestige. My annual spend is 20L mostly corporate travel. Suggestion which one should I use? It seems Infinia has better reward returns? There is 20K fee for Citi and 10K for HDFC. Is there a benefit of getting both? My spend is half flights and remain in hotel etc. As I understand Infinia will give 3.3% to 6.6℅ return where as Prestige will give only max of 3%. All other benefits seems quite same. Citi is known for its Hotel Transfer partners and Prestige is known for the Limo benefit. If you don’t need these, then Infinia would do. It is not just 3.3 -6.6%. You also get 5X with many merchants incl MMT. But if you need limo drops etc you canconsider Prestige as Sid says. Currently i am holding Regalia with 4L limit (LTF) for past 1 year and HDFC credit card account for almost 8 years. Also, i am classic customer have saving a/c for almost 5 years. am I eligible for infinia? and what approach should i take to apply. Its quite tough. You need Imperia range of relationship to get Infinia. I currently am a preferred account holder with HDFc but am eligible for Imperia Banking as well. However the branch i have my account in does not offer imperia accounts. Therefore i will have to transfer my account to another branch in order to get my account converted to Imperia. I currently have a Diners Club Premium card which is LTF. Should i transfer my account and get it coverted to Imperia ? Will i be getting any extra benefits on that ? Though my current income doesn’t qualify for Infinia but will converting to a Imperia account make me eligible for a Infinia (LTF) ? You can certainly get Diners Black with Imperia but Infinia is a hit or miss. As i mentioned in the article, Imperia will help to certain extent, but you also need other to be strong in other aspects as i mentioned in the article. You don’t have to transfer all your accounts to another branch just because you want imperia upgrade, Talk to the branch with has imperia program and they will remove preferred relationship manager and assign Imperia relationship manager, You will have bank accounts in your existing branch only but your imperia rm will be in new branch. I did the same so i know for sure. P.S your preferred RM will not tell you this because he will loose you as a customer so talk directly to imperia RM. i have just been upgraded to Infinia. I do not have a salary of 40 lakhs and instead my gross annual income is Rs. 26 lakhs. if you would like to know the reasons for the upgradation, i guess the following could come in handy for anyone looking for Infinia. i have been a customer of HDFC Bank for nearly 17 years. i have also spent more than Rs. 12 lakhs with my Regalia during the current financial year. Besides, i work for the central government. my branch manager was of the view that Rs. 26 lakhs in govt is worth more than Rs. 50 lakhs in private sector( govt has no concept of CTC and instead every reimbursement other than salary is on actuals). btw, the limit that they have given on my Infinia is only Rs. 8 lakh. so i guess you were right on the money when you said that its the relationship that matters and not just the salary. Take heart, everyone ! Here is a useful information on how to get HDFC Bank’s INFINIA CREDIT CARD. I have already completed documentation and awaiting for CREDIT CARD. True with the said points. Also, Interesting about the FD thing. Did they mark a lien on the card? Since they issued this card against FD, I can not widraw this FD aslong as i hold this card, I have to surrender this card then only can i widraw FD. Just received my Infinia Card, I didn’t have to cancel my regalia to get Infinia, Regalia gets canceled automatically when i got Infinia. My regalia was lifetime free this is not even tough its gives as an upgrade, anual fee of 10000 is charged but in return i get 10000 rewards so its practically free. Thanks for sharing your experience with Infinia, especially the Imperia RM without change of branch part is very useful. or, was it Regalia old limit+FD amount? congrats Malav kumar for the INFINIA. Maintain a minimum Average Monthly Balance of Rs.30 Lakhs across all your Savings and Fixed Deposit* accounts. In the same manner every branch’s credit card guy has Superior, So if you live in Bandra, Mumbai then your branch will have credit card guy who reports to someone who is not Branch Manager, but we can call him credit card cluster manager, so when we make special credit card request for odd upgrades like regalia to infinia or floater card etc then those requests get sent to HDFC Credit Card Cluster Managers, some cluster managers are quiet relaxed about rules and some are not so one person on this blog may have obtained upgrade or shared limit credit card while other person’s request might be rejected, so if your request seems to get rejected then try to move your account to another branch that’s at some distance from your old branch then make new request and u may have it approved, my infinia card was approved after moving my relationship manager from Memnagar, Ahmedabad to Thaltej, Ahmedabad, All requests are not sent to chennai for process and some are processed at you city only. But matter of fact is, these guys don’t recommend your request easily unless or unless you got enough relationship with bank. In your case, its FD linked card and hence there is no reason for anyone to reject it as there is ZERO risk. But one thing they told me is my credit limit will not increase based on spending because this card is against FD, but i am not worried because i don’t spend 8 lacks in one month. PS, Before i came to know of your website, i Thought i had the best rewarding credit card (REGALIA), and my only credit card but your website has helped me a lot, After i started reading your website, i applied for three more credit cards, If you allow then I would also love to share my journey about how i got regalia card and how my credit limit increased from 2,25,000 to 8,00,000 in two years with detailed spending pattern and and time between each credit limit increase and amount spent between two credit limit increases. Sure, i’ll drop you an email shortly, we may put it as a separate article. Good Info.. thanks for sharing…..I didnt get Inifinia… so finally ended up in Yes Exclusive LTF…. Dear Mr. Malav, thanks for sharing. I am in Ahmedabad and eligible for imperia at my Vejalpur branch. But what is the advantage except zero locker rent ? As per there website they charge Rs 100 plus tax every quarter programme fees same as preferred programme. It was waived off / revered last year after after written request. Even after imperia member, no guarantee to get Infinia credit card. – LTF. While I pay for 100rs + tax every quarter as program management fee for being imperia customer but you get lot more value in return, I will explain below. So your total saving is 42,810, Now you tell me weather its worth it or not. Thanks Mr Malav for in detail IMPERIA programme. It is the highest premium account at HDFC bank. As a preferred customer I am getting all this benefits except locker rent ( I have to pay 50% rent ). My programme management fees were waived off last year , so I am saving Rs. 460 also on this. You can try to get is waived off by calling and writing to your RM. Mr Malav, your Infinia card is life time free – same as Regalia ?? Thanks Malav for sharing ur experience regarding IMPERIA n INFINIA. Its nice to learn all internal process at HDFC bank cards. No it is not life time free, It has anual fee of 10,000 rs per year but in return i get 10,000 reward points worth 10,000 rs so its practically free. Hi, you may need to pay 18% GST tax around 1800rs for 10000rs annual fee. So this 10000 rewards points, we can redeem for credit card bill payment ? Or we need to purchase some other things like flight or anything from catalogue ?? Flight and other redemptions usually. You can use 10,000 reward points to purchase thing from reward catalogue, recharge mobile and dth, book flight and hotel etc, but its best used and valued when used for hotel booking or flight booking and dth and mobile recharges. Malav, I am also shifting my account from Bodakdev to Thaltej-hebatpur road branch ( but they don’t have imperia programme). Do you pay 11800 annual credit card fees and against that points you can redeem to buy amazon / shoppers stop vouchers of same value or less value ?? You can buy Rs 10,000 value goods from rewards point or only flight and hotel bookings ?? Rs 1800 tax is not refundable from rewards points ?? I have a Housing Loan with HDFC and will fall in to their definition of HNI, will I be eligible for infinia card? Just housing loan won’t help. Depends on lot other factors. Talk to your RM. How is infinia better than hdfc diners black. I am planning to go for diners black (even though I am eligible for infinia)? Infinia should fine as they’ve recently added 10X to all cards on smartly spends. Is infinia like a pure superset of diners black then? If not in what terms is it better? I have heard plenty about the features in diners black as far as lifestyle is concerned i.e 10x reward points, bookmyshow offers unlimited, unlimited lounge access, can use it for uber, Amazon etc. Do we enjoy the same privileges if we hold infinia? If you’re more of a person who needs 10X benefits, go for Black. Else, if you’re happy with unlimited PP and limited 10X benefits, Go for Infinia. Thanks Siddharth. Will go for Diners black then. Will upgrade to infinia if I get a better offer there. I have recently upgraded from Diners Black to Infinia, mainly because the conversion rate in infinia is much better than Diners Black. Diners Black charges like almost 1 re more for each USD when compared to infinia. I dont find any difference between the 2 except the 10X points offer in Diners Black. So diners black is better till the offer. I see other blogs that hardly update content but you update regular and best part take time to reply to every comment here that users put, much appreciated mate great quality content with outstanding support. I took your consulting and after 3 months I drop an email with some query and you answer that in no time which is really sweet. Thanks for your kind words Yazi. Stay tuned! Does HDFC Infinia gives 5X points for fuel purchase at gas stations ? Okay, latest update regarding upgrading to Infinia. I hold a Diners Black from HDFC. Spoke to the relationship manager and inquired about an upgrade to Infinia. He said that was possible only if I had such an offer on my card. It wasn’t there on my card and I asked for alternates. He said that for salaried personnel the monthly income must be 4L and for self employed an ITR showing at least 40L. You can use the points for flights. But first of all, 12L on FD is not a right choice to park your money unless you plan to use Priority pass to the tune of 100 visits or so a year. I’ll write a detailed article on this in sometime. HDFC want me to change my resident Regalia to NR Infinia but with INR 8 lac FD lien. My annual spend is approx. INR 12 lac. Shall I opt for it or go with SBI Prime / SBI Elite? I feel SBI Prime’s reward points for insurance payments is 5% and my annual payment for insurance is around INR 10 lac. Another benefit I see with SBI Prime is I can pay dues using reward points which is not possible in Infinia. – My primary card is Amex Plat Travel credit card, which I have been holding since last 7 years (Amex KF before that). Annual fee was waived off every yr because of spend patterns (arnd 5L+ every yr) This year they are refusing to waive off, even though spend is 6.5L. I am thinking of cancelling this card as I dont want to pay the fee. I use the MR points heavily for air travel (Indigo) – family vacations, and this has been a big reason for this to be the primary card. – Other card is HDFC Regalia – used wherever Amex is not accepted. Guess the spend will be 1 – 1.5 lakhs a yr also. This is LTF due to relationship wt bank, credit limit 6L. Have Priority Pass card, which is also used. However, not a fan of the rewards program and have not used it much really. 1. Should I cancel Amex Plat travel card to avoid the fee (6k incl GST)? Will I miss the vouchers (now Spicejet or their own travel portal)? 2. And if I cancel, will the Infinia have similar or better benefits than Amex travel (I am looking at travel vouchers mainly). Would be great if you can respond at the earliest, as I need to make a decision fast. Amex plat travel still has good reward rate. They seem to waive off on spends north of 10L these days. IF you’re limited to yearly spends of ~7L i guess you should continue with Amex as you also get travel offers. There are many other factors to decide though. For ex, if you fly intl often, then Infinia might help due to unlimited PP. You can use your MR points to waive off the charges. i currently own a Regalia Credit Card and thinking of upgrading it to Infinia but i don’t use my card that much.will it be of any use if i upgrade or should i stay with Regalia?? If the PP usage is not much and card is generally used for shopping and travel with annual spend around 8L. Is Infinia card still good choice given that now I have an option to get one? or there are other cards that offer greater benefits? Cancelled my Diners Jet because lack of acceptability. Currently using combination of Amex Travel and HDFC Jet World. Hey all . I recently got the email to convert my resident regalia to NR card . I applied on the online form with the FD made and there was radio silence for a week . When I checked up with the branch and phone banking , no one could give me an update on the application status . The branch said that NR infinia does not exist and the phone banking guys told me to talk to the branch .the branch also advised me to apply for NR regalia . When I mentioned about the email I got , they told me that a “central team “exists which sends the mail and they have also the authority to grant cards .they apparantly work parallel to the branch cards division. I am not an imperia customer with HDFC nor did I have a high credit limit with my old card . Any ways long story short I got my infinia card yesterday . I honestly don’t know what criteria they use to accept as it appears very random . Do you maintain high-value Relationship value with HDFC? As in FDs? Not sure if it’s relevant but the year I took my first salary, I had applied for a SC rewards card with zero annual fee and was rejected but was given a Citi PM as I had a Citibank account. Not sure what are my past sins but my cibil is absolutely clean. Infinia for 4L P.A !! I wonder what triggered the upgrade. Do you(wife) maintain high Relationship value with HDFC? Coming to your case, consider dropping an email to escalation. You could get Infinia right away! Keep up the great work Siddharth & Abhishek ! 1. I have regalia and diners black. 3. Since I was in the 35L ITR range I asked my RM to bump me up to Infinia. 4. Not possible RM said after doing max negotiations with credit card team. (I believe my RM). 5. Also limit enhancement when one holds two super premium cards is NOT possible. (My current limits regalia: 2L, black 4L). So that’s my Infinia story. Like someone in Citi Prestige thread option mentioned…maybe time to either move from HDFC in toto and become a Citi Gold Client (with its associated pro rata bonus + renewal bonus via Prestige) or just move onto Prestige for now and wait out/work out for ITR to get Infinia friendly. 2. Jan 2019 (4L > 5L > 8L limit. Holding card since August 2016). My DCB was blocked for using it on a virtual currency site. I transacted inadvertently. 3. Today found Infinia upgrade option for Regalia when I logged in. 8L Limit. Didnt take screen shot post confirming upgrade, so wondering if calling HDFC CC will help. Also hoping Infinia upgrade doesnt affect DCB reissue. PS: Not happy with my RM, so the question here. I’m also dying to get HDFC Infinia. I spoke with the RM but no luck. I own Regalia with 6.8 L limit and also a Yes First Exclusive with 5 L limit (Both LTF). I read though all the replies and I suppose gradual upgrade , better relationship and spending pattern along with your existing limit holds the key. I have HDFC credit card for almost 6-7 years and upgraded to Regalia in last two years with CL of 5.3L. I have kept good credit scores and scheduled repayment of all the outstandings. My annual income is around 13L. Will I be able to get Infinia or Diners Black? I do not have an RM, hence please advise how to approach. Send IT papers to Chennai address for Diners Black. You’ll mostly get it as its above the floor limit. Infinia is impossible at this stage. I have a 9 year relationship with HDFC Bank. I started out with the Gold card and now have a LTF Regalia with a limit of slightly more than 9 lakh. I have an ITR of 36 lakh. 800+ CIBIL score. No other relationship with the bank. a)What are my chances of getting Infinia LTF? b) I plan to write to them that I don’t want to use Regalia any longer because of the devaluations that’ve happened. Does that sound like a decent reason to request upgrade to Infinia? quick question – does Infinia allow access to domestic lounge as well via PP? The visa infinite variant does not have access to all the domestic lounges it seems. Not PP. You can also get MC variant on Infinia. hey sid , really wanted to hdfc infinia or hdfc dinner black ..which is best among the 2.. the only draw back is most overseas payment dont accept dinner card …were only visa or master work…so which one is better among the 2. CL is too low to aim for Infinia. RM is essential for Infinia as the application has to go through RM/BM. The HDFC Regalia is my secondary card – my primary one is Citi PremierMiles. However, I have a fairly high CL on the Regalia – it is just over 15 lacs. I don’t have an account with the bank. How do I go about getting it upgraded to an Infinia? Interesting. Never heard of Regalia with limits like 15L. Reg. upgrade, Infinia is usually processed for approval from branch side. You might need to email HDFC or just visit the nearby branch to know the upgrade process for your case. Thanks. I didn’t apply for any limit increase – they just have done it gradually over the years. I find the CB PremierMiles the best card for tickets – do you reckon there is a better card for air miles? I’d happily change that to my primary card. Appreciate your response. Airmiles – depends on what airlines you’re interested in. Hi! I posted this query earlier but my comment did not get moderated. Im not sure why. Please advise whether MasterCard variant of Infinia is better than the Visa variant of Infinia in terms of lounge access, offers, foreign currency spending conversions etc. In real world usage the variants you choose doesn’t matter much. I have visa infinite variant but I am able to access domestic lounges not covered under visa program using the Priority Pass. The PP usage in domestic lounges comes complementary only with the Infinia card across the HDFC CC product portfolio. However, I have read that there is a slight advantage in foreign exchange conversions using the MC platform as opposed to visa. In terms of lounge access, MasterCard is indeed better than VISA because of the range of lounges to which you get access. VISA isn’t even close to MC. Regarding offers, VISA Infinite is indeed one of the best cards to have. It has a lot of perks with BookMyShow etc. Foreign currency spending will be similar to MasterCard as the currency exchange rates of MasterCard and VISA are quite comparable. Most of the places in the world accept both VISA and MasterCard alike. So you won’t run into much problem when you consider that. But just to be safe. ALWAYS keep 2 or 3cards preferably all on different platforms. If you have one VISA and one MC, I’m sure you won run into any problem. 1. Visa Infinite BMS offers. 2. Visa Luxury Collection hotels. You get $25 food credit. This is similar to Amex FHR. 3. Visa Infinite Concierge. This is important because Infinia concierge is probably the worst in the country. 4. 2 stays to Hilton Gold. 6. Access to Visa Infinite travel desk. 7. Discounts on meet and assist services. If these benefits aren’t useful to you, I would reconsider getting Infinia in the first place. If you’re looking into it for Vistara Gold, Axis Vistara Infinite is a far better card to have. But keep in mind the service level that Infinia provides is bad and is not even in the same zip code as Citi Prestige and Amex Platinum. So it has never been a luxury card in my book. Visa/MC won’t matter for forex rates with HDFC as HDFC buys USD in blocks and you get same rates, depending on when transaction is finalised. Most people who claim MC is better do two transactions one after the other and then compare. But that’s not how it works as forex rate you get is the one that is applied when transaction is finalised and pulled, not when you actually swipe. MC has slight edge over Visa in domestic lounges. Infinia PP will not work in domestic lounges anymore. If forex, offers, and lounges are concern for you, get Diners Black instead. Thank you Amex guy for that insightful response. I wanted to pick your brains for the best card in terms of rewards and features between HDFC Infinia, Yes bank First Exclusive, Citi Prestige. Not considering Amex Platinum because of the 50k annual fee. Are there any other cards out there that you would recommend? Visa amd master almost have the same lounges but master has slightly more choices. I have heard that currency conversion charges are slightly less in MC. Rest they are same except for bookmyshop one on one offer which is available on visa. If you dont have any visa card you can go with master. I have both world mastercard and visa signature. Not sure how many infinia holders are aware of it but there is a fastastic MMT offer of flat Rs 5000 discount on domestic flight bookings of Rs 10000 and above. Excellent offer to redeem on rock bottom flight fares! Why do you say ‘Infinia PP will not work in domestic lounges anymore’? I’ve been using Infinia PP to access domestic lounges without any issue (the latest usage was today). I have the MC Infinia (I hadn’t specifically asked for it but thats what I got). Would you recommend switching to Visa Infinite. Does HDFC perform such a switch for an already-issued card? I have been offered a Business Infinia by the local hdfc branch. Are the features and perks same as a personal Infinia? Got my Infinia card last week. I noticed the add on cards i received this week did not have the Priority Pass cards. Does anyone if these need to be applied separately? He is correct. I hold infinia and have DCB as addon. This is probably the only workaround. Hi, what do you mean by having DCB as an add-on? Do you mean that both share the same credit limit? What I meant was my mom holds a the DCB and I use it as an add on card holder. – the annual fee is waived if spending is > 8 L in a year. It’s a fabulous card to have. Firstly thank you for all the info on your site..very helpful…a lot of research i must say.. So, i’ve just received my HDFC INFINIA card.. and i was wondering how you calculated the 3.3% return rate..when i checked the reward catalogue it was coming to less than 1.5%.. still better that my ICICI DIAMANT card..Pls let me know what’s the best way to spend the points as i have a lot of spends this year and i might as well get the maximum out of it. Also.. would you suggest i use the HDFC INFINIA or stick to my ICICI DIAMANT.. i also have an AMEX PLATINUM RESERVE Credit Card but its capped at 3lacs/month whereas my other 2 cards are capped at 20lacs/month. I currently hold an HDFC Regalia and have been offered an upgrade to either the HDFC Infinia (Visa Infinite) or HDFC Diners Black by my bank. I travel frequently and my primary attraction for getting these cards is that both offer unlimited lounge access across domestic & international airports. I already hold Visa Signature (SBI Elite) and a Mastercard World (ICICI) cards..so the lower acceptability of Diners at some outlets will not be an issue for me. The the Diners Black has been offered free for lifetime, however the Infinia would be free only for the first year and renewal fees of 10k will be applicable from next year onwards. My annual spends on this card would be approx 4L hence I will not qualify for the renewal fee waiver on the Infinia. Which one should I pick and why? My take would be that you go for the Diners Black since the 10X program is unmatched by any other card. Also since you already own the premium variants of VISA and MasterCard, having a diners variant would be advantageous at times. I have been holding DCB for a year now and I am completely happy with it. When compared to the Infinia, the only disadvantage would be the lack of unlimited lounge access for the secondary card at international lounges. My secondary card is accepted at all lounges in India but not abroad. Infinia provides unlimited priority pass for secondary card as well. But in your case you will end up paying 10K for the unlimited lounge access since you were mentioning that your spends wont exceed 4lacs and you will end up paying the annual fees. Nice that you got an upgrade. Could you tell how much usage you had on Regalia on annual basis to qualify for upgrade. I got an upgrade to Infinia with almost no transactions on my regalia card during past 1 year. My father actually got a diners black last year, so we only used DCB after getting add on cards. But they still kept increasing the limit on my regalia, and once my limit was increased to 10L, within a month I was offered Infinia through net banking. My payment record is flawless, and have very good banking relationship with HDFC. Though my experience says banking relationship is not a criteria for automatic upgrades. Relationship does matter when you’re applying, but upgrades are system triggered. I have applied for infinia credit card based on itr criteria. Its more than 40 days now. Can the experienced forum members tell me how long does it take? And where should i contact to get the application status as the branch ppl are very casual. Contact customer care through both email and phone. Put pressure on the branch people. If it is a straightforward case and no issues with the background checks (CIBIL etc.) then it takes a maximum of 1 week to 10 days for them to process. It is better to pursue it with the credit card acquisition team since your RM will also be taking their help for processing your application. Take his name and number from your RM and followup with him for exact status. 1st of all, thank you for creating this space. I discovered this website only a few weeks ago and have been feeling like a new world of knowledge has opened up. I have never enquired or checked about what I can do with my Credit Card. I currently hold a basic HDFC ALL-MILES. Now, For the 1st time, after reading your work, I’m keen on upgrading my card. 2 years ago, I closed a 10L+ Loan with HDFC. Else, I realised that through Netbanking they want to offer a Regalia. You can try for infinia but will definitely get diners black…ask your RM and branch for infinia. They are saying that for Infinia, ITR should be in the range of 40L. So now what They are offering (and I am considering) is splitting my card into 2 cards. Reading the review of Diners Club Black on this website, I’m planning to say yes. Your thoughts? I had a 6L regalia limit. When I opted for DCB, they split it into 4L for DCB and 2L for regalia. I would suggest go for the split offered. Over time with your spend levels your DCB limit can go up substantially. I now have an 8L limit on DCB alone. Regalia remains at 2L. I hardly use regalia. Since you seem to be closer to the 40L requirement for Infinia, you can in due course upgrade regalia to Infinia. My experience has been – If one doesn’t meet Infinia requirement but still wants it, they ask you drop DCB. Have fun with DCB while the party lasts! Utkarsh…..thats how most people do….split into diners blach and regalia….go for it……i am actually waiting for my limit to cross Rs8L and then try an upgrade for yes prefered to exclusive. Eventually you will have two credit cards from HDFC and both will have 8,00,000 limit so total of 16,00,000. I’ve one doubt regarding splitting the credit card limit. How to get it? My DC Black limit recently increased to 9 lakhs. I would like to split a portion of the limit either to regalia or jet signature. I would say it’s a good decision and go ahead! Thank you all… I have applied for the same. They say cards will be here in a week’s time. Thanks for your opinion members. Still struggling to get the card. Today i had to fill the upgrade form again for infinia application. Just wanted to know that in card upgrade do they transfer the points from my old card to new or do i have to use the points in my card before upgrade as nothing was mentioned in the form and RM had no idea so he said to use it or you may loose. I have a Regalia card with a limit of 8 lacs (recently enhanced). My spends in the last year were around 14 lacs. My ITR is around 24 lacs with a 820+ Cibil score. In addition I have a business account with HDFC – FDs in excess of 3 crore. Can I expect to be approved for the Infinia card? Many thanks. Your ITR is a bit on the lower side for Infinia but given your NRV they may very well offer it to you. Talk to your RM. First your limit on DCB will be decreased and then you will be issued your desired card. Is Infinia, with benefits curtailed off late, still one of the best credit cards in India? Happy and excited to share that finally my Infinia has reached me, with an add on card for my wife and and priority pass for both of us! Still learning how to put it to best use, and would appreciate guidance from this forum regarding the same. @Agrim, the equivalent of your current points gets transferred upon upgradation. So no need to spend the points prior to upgrading. I have an offer to upgrade to Infinia. My current credit limit on Regalia is 9.5 lacs and I do spending in excess to 8 lacs p.a. on this card. I also hold An Amex platinum travel card where I spend an equal of 8 lacs (cr. Limit – 5lacs). Given the recent reward program upgrade on Regalia where you are eligible for a bonus of 15k points if your spends exceed 8 lacs in a card calender year; I would like to ask the forum here does it still make sense to upgrade to Infinia. I think it might reduce the reward rate on a large extent? If you do the math, You will see that you will only gain and don’t lose anything. Let say you are spending 9 Lakhs per year. You are not spending on 10x partners too, just for simplification. Whereas in Regalia, you will get 9,00,000 / 150 = 6000 * 4 = 24,000 + 15,000 (Bonus reward points) = 39,000 points which is equivalent to 19,500 rupees. When you spend on 2x partners and Smartbuy (10x), you will reap more. How much limit is required on existing card for upgrade to infinia. I have a limit of 8.05L on DCB. Based on one of the interactions I had with an HDFC CC representative, it should be possible with 8L+ credit limit. Is it possible to get DCB changed to infinia but without having HDFC bank account? I’ve Never heard anyone holding Infinia without a great relationship with Bank. I have both DCB and Infinia without an HDFC account. And 1 DCB in my wife’s name as well (not add-on) – she doesn’t have an account either, though we had to open a FD to get her a DCB. How many months back the second card was applied?(DCB/Infinia). From the last 5-6 months, there have been some policy changes and it is very difficult for someone to get a second card now? If you can share your experience of holding both premium cards without any other relation with HDFC Bank. It would be good inputs for us. How did you get infinia without account? I have DCB without account and it was purely because of an RM in HDFC. My friend has HDFC account, and his RM processed DCB for both of us. How much FD is needed to get DCB ? Any idea about how much you have spent in the 6 months? Did they ask for any ITR to process the upgrade? can you use priority pass in domestic lounges for free? Why would you want that GK? DCB is the best card IMHO, except for the lounge access for the add on card. Even if you were to pay for the lounges sometimes, you will still end up getting more benefits (in terms of points) by using DCB. Instead of swiping DCB for Infinia, just go for another card like from Yes Bank, who would give access to Add on card members also. @sid – I think it’s time for an updated review. what about cash withdrawal ? For ex: if the limit is 10 laks with 40 percent limit , can you withdraw 4 laks every month? I currently have Regalia card (only 3 months old account) with limit as 5 lacs. I am a government doctor with annual income around 24lacs. What chance do I have of upgrading to Infinia? Also I do not have HDFC account. WooHoo! Received an upgrade offer to Infinia! Eagerly awaiting to get it in my hands! 1. Earlier hdfc card type – HDFC Regalia. 2. Using hdfc cc for how many years – 5+ years. Started with Regalia itself. 3. Earlier hdfc card limit – 8,50,000. 4. Account status- Preferred/ Imperia – Preferred (1L in savings account AQB). My brother in law holds Infinia on Classic Programme. 6. Any more information you would like to share that may help – My Regalia was due for yearly credit limit enhancement. Found this Invitation in the net banking section. Had MC World Infinia before. Changed to Visa Infinite Infinia version now. Thanks for replying in detail and congrats once again. 1. How much was your annual spends ? 2. Where do you spend ? 3. Do you have any car, home, business, etc. loan with HDFC ? 2. Where do you spend? – On everything except fuel. Mobile recharges, grocery, dining, coffee, departmental stores, movies, DTH, online/offline, flights, International spends, furnishings etc. 3. Do you have any car, home, business, etc. loan with HDFC? – Nope. Congratulations on the upgrade Shivi! Amazing to know these details. Wanted to know what limit did you start with and how many years did it exactly take to upgrade to Infinia? Also is Infinia offered to you as Lifetime Free card since it is by invitation? Also was your Regalia card Lifetime Free? Wanted to know what limit did you start with and how many years did it exactly take to upgrade to Infinia? ~ 5 years. Also is Infinia offered to you as Lifetime Free card since it is by invitation? – Not LTF. Also was your Regalia card Lifetime Free? No, it was not. I received Regalia in 2013 when it was for 5k annual charge. Infinia, that time, was for 30,000 annual charge. Thanks for the response Shivi. What limit did you start with on Regalia in 2013? And if you remember, can you please share what was your approx annual spend and biannual/yearly credit limit enhancement in each of the following years till 2018? Was it always auto credit limit enhancement or did you manually request anytime in these 5 years by sending CL enhancement form to Chennai? And as mentioned by you in your next comment, why did you close your YFE assuming it would have been offered as LTF? Thanks for the response Shivi! What credit limit did you start with on Regalia 5 years back? Also did you apply for any LE by sending a form to Chennai or you just waited for the auto LE to kick in? Also did this LE happen every 6 months or 1 year? Also during these 5 years what were your approx annual expenses on the card and what was exactly was your credit limit in each of these years? Asking a lot out of curiousity, but this information will certainly help. Thanks in advance. I also received offer for infinia credit card and i have received the infinia credit card also, can you tell me what difference it will make with visa infinite and MC world, presently i have MC world infinia credit card. Hi Gabriel. You need to compare the offers of Visa and MC and their specific variants on the respective card sites and see which suit you the most. Most of the offers pertain to the hotel brands. I held YFE on MC platform (closed now) so decided to take Infinia on Visa platform. was ur regalia card ltf.?? @ AshishR ~ Thank you. I just upgraded to hdfc regalia from regalia first. Earlier in march got handsome amount to limit increase to 4X. It is shown under net-banking. I am preffered customer. My spends were very high from past 3 months say approx 5-7 lacs. Just wanted to know how much time should i wait for LE or card upgrade? Should i manually request after 6 months/ one year or wait for Auto LE/ Card upgrade offer for DCB/Infinia. I can’t really say without constructive inputs from your end! What’s your Regalia limit? HDFC card member since when? Take-home monthly salary/ITR? Business/Salaried? 4X limit of what? Sid, you’ve given such in depth reviews of all the cards going around. However, you’ve missed 1 very cool program offered by hdfc – their Global value program. They charge you Rs. 200, give back 500 points (which mean Rs. 500 for diners and infinia). After this they give u 1% back on all international spends, thus making effective international markup fee only 1%. Add to it 3.3% points back, meaning a net gain of 2.3%. For diners, even better as you get 33% point back on pos transactions, but diners acceptability is a big problem internationally. Will be great if you could add this program info to all your hdfc cards reviews. Good work, keep going. Actually, RM, the net return on Infinia after Global Value Program would be 1.97% and not 2.3% as there is an 18% GST on the markup fee which effectively takes the 2% to 2.36%. Also, you missed out on the 2k Yatra flight voucher you get on spending 150k Internationally under the GVP! Hi, Anybody used the card for golf programme? Please provide review if anybody used, what are the charges involved. There are no charges for doing the golf booking from bank. DCB is the best till the offers last. Alarming update: 4 complimentary lounge access per quarter through Infinia Visa/Mastercard Card Lounge program – UNLIMITED NO MORE!! Do advise on Any other card with comparable benefits that I can consider, as loyalty lies now with the bringer of best deals! Thanks Siddharth for the regular updates and keep sharing! @ Dev – Check out StanChart Ultimate, SBI Prime, SBI Elite and CitiBank Prestige credit cards or AmEx Platinum Charge Card. Just depends what you are looking for. It made more sense to me holding SBI SimplyClick so I downgraded from SBI Prime. If you are holding Infinia, Can’t you use your Priority pass in domestic lounges too? @dev. Hi I got a offer in netbanking to get diners club black. I spoke to customer care and finally after few weeks I have escalated the matter due to poor response. I have been using hdfc credit cards from past 9 years and currently have a LTF Regalia. Now the worst part is manager says that by default they send to all customers regarding diners club black card upgrade 🙂 and I am not eligible for it. Also bank said they no longer give 2 cards. In comments I have seen people holding infinia and black. Does pre approved card means it is still not approved? If bank denies black then I will ask them for infinia. Does smart buy has 10x for infinia too? Ask the bank people. Never met anybody holding Infinia LTF without a clause attached to it! What credit limit did you start with on Regalia 5 years back? – 3 Lakhs. Also, did you apply for any LE by sending a form to Chennai or you just waited for the auto LE to kick in? – No application sent for L.E; only the auto LE offer. Also did this LE happen every 6 months or 1 year? – Auto LE was every 1 year, not 6 months. The LE offer used to be there on the net banking page. Also during these 5 years what were your approx annual expenses on the card – 2 Lakh to 4 lakh. what was exactly was your credit limit in each of these years?- Started at 3 lakh, auto L.E was 30% increment of previous year’s limit. So 300k, 390k, 507k, 659k, 859k~ and Infinia. Asking a lot out of curiosity, but this information will certainly help. – No problem. Is there is there any difference in offers or rewards between Infinia Master Card World & Infinia Visa Infinite. Which variant would be more beneficial. Depends what perks you are looking for. Go through Visa and Mastercard cards sites and see the benefits of the variants to decide. While upgrading from REGALIA to INFINIA are the RP get reduced by 50% and deposited like they do incase of REGALIA to DCB upgrade? Confirmed its 2:1 like DBC which is very sad because my old CLUBMILES did 1:1 when upgraded to DCB and its suppose to be a equal/lower card to the REGALIA. In a perfect world it should be a 1:1 transfer with respect to INFINIA. It should be 1:1 in perfect world. In infinia 1 point is equal to 1 Re and in regalia it is 50paisa. This also explains the conversion. I have ITR of Rs 83 Lakhs and hold HDFC Diners Black so can get this because I cannot get any options for upgrade on internet. Upgraded from women’s solitaire card to INFINIA in 2 years. RP transferred @ 25%. Spends on Solitaire card were hardly in the range of 10-20k per year! Is there any cap on monthly rewards in infinia? Although I can’t find anywhere. Recently I got to know HDFC Dinners Black had capped max monthly and cycle rewards. I have spending of Rs 42 Lakhs on my commercial electricity bill. Will i get 3.33% reward on it? So will i get approx 1.33 Lakh if i use infinia or dinners black? No bank wants to reward those who’re using personal cards for commerical use, especially when the spends are so high, like this. There is no cap.. I have been spending a lot on Infinia..
Quick Query… how are the points redeemed for Infinia? If the rewards platform similar to Regalia – like redemption options only for hotel, flights etc? I hold Regalia & Diners Premium but usage is low because of limited redemption offers (flights, hotels are no no for me). My most spends are with Yes First Exclusive which gives me like 2.5% rewards and then I use for Gift Vouchers. HDFC Infinia is offered to my wife (paid version) but wanted to be sure of it before applying. Need to be sure that 10K points which one gets of fees payment can be utilized effectively. @Gagan – Reward redemption for Infinia is on the same lines as that of Regalia. You may look at the standard chartered bank Ultimate credit card for your needs of redemption vouchers. That too gives you 3.33% return, on pro-rata basis. Thanks Shivi for the feedback. Will explore Ultimate Card. I have SCB Visa Infinite LTF already along with SCB Manhattan (paid). I have a Diners Black with 8 lakhs limit for the past one year, Regalia with 5 lakhs limit, several family accounts and demat accounts. I also opened a current account, a few trading accounts and a locker with the bank this year. I also bought a couple of health insurance policies with the bank. We were imperia customers in the past but have been preferred customers with the bank for the last 5-6 years. I asked for the Infinia in May 2018 but was told about the high ITR criteria. i was instead offered the Diners Black with limit of Rs 5 Lakhs and Regalia LTF with limit of Rs 5 lakhs in place of my existing Regalia with a limit of Rs 10 lakhs. In the last year I had spendings of over Rs 9 lakhs on my Diners Black and my limit was increased last year itself based on an online offer to increase limits. I called up the call centre. They checked up and told me that they do not currently have an offer to upgrade the card to Infinia. They asked me to tell the branch to forward my application. Would it work out this time because I have a good relationship with the bank but I do not have a high ITR? I too had been trying for Infinia but was just falling short on ITR and was making do with DCB and regalia. Recently an inadvertent transaction caused me to lose my DCB… It was blocked. In no one time I saw regalia to infinia upgrade option in my account. I took it with both hands. Spoke to my RMs supervisor to reinstate the DCB. The credit card guy told me since I already have the infinia they can’t reinstate DCB at my current ITR levels due to the exposure they have on me. But he said on a 5/6 lakh FD he can get me the DCB. Yet to make a move on it. I’m sure you get the drift :)? 5/6 Lakh for DCB is fine. But, do you have any idea of how much FD value is required for getting Infinia. Coz, Infinia is far better than Diners in terms of acceptance both online & offline especially when we need to do high value transactions ie. > 1 lakh. Apart from that Infinia has NPSL. Excellent info – great site!! I have one question about Infinia which I just got recently. Do I need to pay for my minor child for lounge access? Depends on lounge to lounge @Bala. How “minor” are we talking of? 15 yr old. Cannot get an add-on credit card also at her age. That’s not minor in lounge language. She’ll be charged as per guest charge. Assuming acceptance of DCB is not an issue for me, except for Unlimited Priority Pass access, what are the other aspects where Infinia is better than DCB? As long as 10x continues DCB is the best. Infinia doesn’t have anything special benefit over DCB apart from lounge access you said which also if you think is not a big deal. Also infinia doesn’t have diners specific 10x program. If someone is not looking for 10X partners then Smartbuy gives 10x for Amazon, Flipkart & other partners which is why I opted for Infinia. Smartbuy 10x for Amazon, Flipkart is available for DCB as well. Isn’t it? So there is basically no real benefit of Infinia over DCB (except unlimited PP access). Will i get 10x on infinia through smartbuy. Ideally i should. Also, what is the upper limit of 10x points infinia. Diners has 25000 per month as of now. Wife has diners club black, yes exclusive and SC ultimate cards…..we have imperia account and i have 8L on my regalia….was thinking of getting infinia. I am a government doctor with professional experience more than 30 years. I did not have any credit card before HDFC’s Credit Card which was offered to me in August 2018. My CIBIL was high but there was only one entry which was a closed auto loan I took in 2010. My first credit card was HDFC Regalia. I have been HDFC’s customer since August 2018 and did not have any account with HDFC. I opened a joint account with my wife as sole owner and I the second owner. The account was categorised as ‘Preferred’. I have been Regalia with 5 lacs limit since August 2018, this is my earliest association with HDFC. Have been using Regalia, average spend per month was around Rs 87,000. I had sent an email to the Customer Service to upgrade my card in November 2018. They asked for last two ITRs and the computation sheet as well. They sent a representative to collect my ITR and the computation sheet. The most recent ITR was for Rs 36,00,000 and the previous one was for Rs 21,00,000. It almost took 2 months for them to get back to me and approve the card after I talked with one of the higher-ups. Now the limit on my Infinia is Rs 8,00,000/-. Upon asking my RM why I was approved the card despite not having required relationship with the bank, he said that they treat Government Employee in a different way than they would treat a private sector employee, as the former has highly stable source of income and are reasonable to deal with. Have been using it for a month. The reward is just crazy. The 10x Reward Points offer is simply awesome as it offers 33% rewards back when shopped via SmartBuy, I just hope it continues post 31st March 2019. If you have a query, do let me know. Got hold of Infinia today. Had no plans of applying for it (even though I met the income criteria but was not keen on paying the joining/renewal fees and not a heavy spender as well so spend based renewal is not an option) However to my surprise when I visited the branch for some paperwork, my RM mentioned that there is some special year end offer and I can get this as a LTF variant. After getting a written confirmation of the same applied same day and I received the card in less than a week with a healthy 10L limit. Received Infinia as my first ever CC around 2 months back. Cashback points coming are good and redemption on HDFC Infinia’s Reward website is where 1 point = 1 Rs, so all in all a very favorable card. Also getting it as LTF was a cherry on the cake. Hi , just an update on the Infinia. The Club Vistara Gold Membership seems to be gone away and replaced with a Club Mariott Membership after 31st March. Please update the article accordingly. Source ~ The benefits & privileges booklet relieved with the card.